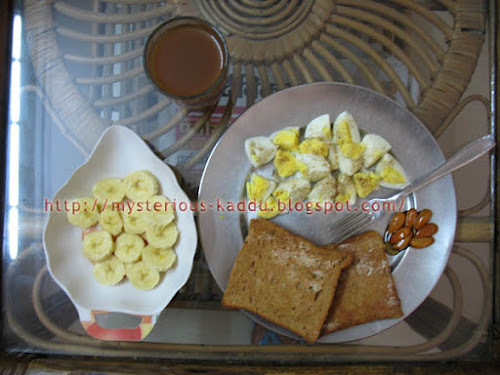 Two hard-boiled eggs, two slices of toasted brown bread, 1 banana sliced, a spoonful of almonds soaked in honey, and tea. This is my 25th post for NaBloPoMo March 2012. Link to the previous post: "Photo A Day: An Animal"
nice, really liked the menu ! BTW what is the importance of almonds soaked in water or honey ? whats the exact health benefit ? Don't know about the water, but honey is said to be a catalyst. It apparently enhances the properties of the substance used with it. That being said, I take almonds with honey simply because I like the taste more than just dry almonds. Isn’t a teaspoon of honey in a glass of warm water taken in the morning – good for health? PS: But should the warm water, lime and honey co-habit? Having it for the last three days and loving it; feel very energetic! Btw, how much time between this and breakfast? No idea. People usually advice to take it early in the morning, on empty stomach.